I thought for this week's Film Fashion Friday it might be fun to create a classic film fashion survey for all of us to fill out. I have seen different types of these floating around the web and I think they are really fun. Hope you do too!! If you choose to fill one out, I have set up a Mr. Linky at the end of the post for us all to share. 1. Name you favorite classic hollywood designer. At the risk of sound cliche, I think I would have to say Edith Head. She was in the business for a long time and really knew how to dress a women. I also really like that among her contemporaries, she was willing to accept input from the starlet she was designing for. I think the looks she created are iconic not to mention, she wrote a book to give the average woman advice on how to dress. 2. Who's movie wardrobe would you steal if you could? Hands down Ann Rutherford's in Orchestra Wives (1942). The 40s are my favorite decade and Rutherford dons some of the cutest outfits in this film, really showcasing the average 40s look that many girls of her age would be sporting. 3. What's your favorite film based on fashion? Pin Up Girl (1944). This film was a close second for a movie wardrobe that I would love to steal if I could. I love everything that every character wears, plus it's in color so we get to see all the wonderful clothing in the colors they actually were. Here I am thinking about that awesome chartreuse number Grable wears.... swoon!! I would normally say Joan Crawford and Adrian because their work together is really out of this world, however I think Myra Loy and Dolly Tree are a team that should have some more light shed on them. Dolly Tree designed for some of Loy's best and most loved films, including three of the Thin Man films. They collaborated more than 6 times and each time produced a wardrobe drool worthy and one that any vintage gal would love to have. Dolly Tree also dressed Lana Turner in the 30s and I really feel had a hand in shaping her "look." I also really love Helen Rose's team-up with Esther Williams and Elizabeth Taylor. 5. Bette Davis or Joan Crawford? Now, I hope no one hates me from this one, but BOTH. Here's my reasoning. Davis for being fashionable in her personal life. I love that we often see photos of her in sports wear and in pants. I feel she is a great icon for vintage sportswear. And Crawford was just fashionable in every aspect of her life. In my opinion, she is the quintessential glamour girl. 6. Favorite old hollywood fashion icon? Lana Turner. I love that Turner loved jewelry -- both real and costume -- so much so that she had custom cabinets built into her bedroom walls to store it all. I also love that she started her career in the 30s and kept on working into the 70s, covering the most fashionable decades. She was a true glamour girl who did the nightclub circuit and was even apart of the original rat pack. 7. Most fashionable character in classic cinema? I'm cheating and picked two. Pola (Marilyn Monroe) in How to Marry a Millionaire (1953) and Frances (Grace Kelly) in To Catch a Thief (1955). I love that Pola has to wear glasses and I feel no one could make glasses look better than Marilyn Monroe. I just love her outfits and that she still can look fashionable with spectacles on, something I feel wasn't easy to do in the 50s. And how could I not include Grace Kelly in here somewhere. She was an icon both on and off the screen and influenced fashion then and now. She had a purse name after her and was a princess!! While most love her in Rear Window (1954), I love her best in To Catch a Thief. I am just smitten with the gold ball gown she wears at the end of the film! 8. What actress do you feel is overrated fashion-wise? As much as I love her and feel she was a very fashionable lady on and off the screen, I feel that Grace Kelly is a bit overrated. Because she has such a small list of films to her credit, I feel that many people place importance on her fashion in her private life verses her filmic life. I don't mean to discredit Miss Kelly in anyway, I just think there are other actresses who have a bigger career to their credit which showcases their fashionability, rather than just a few films. 9. What actress do you feel is underrated fashion-wise? Linda Darnell. She has starred in some really wonderful roles which had her wearing some really wonderful clothing. Plus, off screen she was quite stylish and I often compare her to Lana Turner. 10. What's your favorite film for each of these designers? 11. Favorite outfit or ensamble? 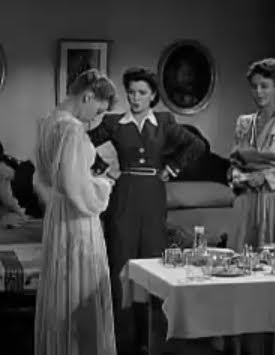 The pjs that Ann Rutherford wears in Orchestra Wives. I fell in love with them the first time I watch the movie. I know this is very simple, but I just think they nailed the lounging look of the 40s. 12. Which black and white movie do you wish was in color to see all the wonderful costumes in color? 13. Biggest Oscar snub fashion-wise? This award wasn't created until 1948, so going on that I think 1957 and the omission of Designing Woman. 14. How to Marry a Millionaire or Gentlemen Prefer Blondes? Gentlemen Prefer Blondes. Love that outfit Monroe wears when they first get on the boat! 15. Favorite film(s) out of each genre? Hope you enjoyed this little survey!! Can't wait to read your answers!! Not a classic, but the HBO mini-series of Mildred Pierce has been amazing and the costumes and street scenes have looked perfect for the time. A fashion survey is the easiest as well as the most convenient way to get to know about the latest fashion trends are hit in the market..
What a fun post! Well done -- and I really must see "Orchestra Wives."